With the opening of Providence ElderPlace in Redmond Providence ElderPlace provides medical and social services to low income and frail seniors on the eastside. The Providence ElderPlace PACE program (Program of All inclusive Care for the Elderly) helps seniors age in place and remain independent in their homes for as long as possible. 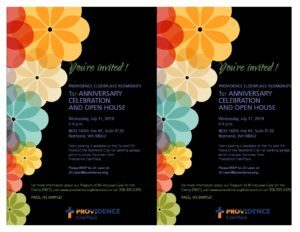 You are invited to tour the Redmond site, meet clinicians, learn about the PACE program enjoy refreshments and celebrate our first year!